My apologies for the hiatus. Please know that it was unwillingly taken. With the spring releases starting to filter out, I’ll be back on a monthly schedule henceforth. This rough-hewn gem is illustrative of a number of crucial facts about the Canadian poetry scene. First, it is divided—and if Twitter and other byways of internet detritus are any indication, the fundamental division is often seen to be not just aesthetic but political, not just a matter of ‘avant-garde’ or ‘innovative’ versus ‘traditional’ or ‘formalist’, but of radical versus conservative politics. This is adolescent nonsense, of course, since it too often rests on a dubiously strict analogy between poetic forms and social formations, as though the eschewal of the formal, prosodic, and rhetorical means that have served the bulk of the English-language poetic tradition for 500+ years automatically implies a subversion of the social order—as though ‘the Man’ himself speaks in rhymed iambic tetrameter. Which brings me to the second fact about our CanPo moment: its pervasive sense of division is largely fuelled by illiteracy. Not just political illiteracy—though the marshaling of the word “neocon” above is truly dumb, trivializing an insidious cocktail of corporatism, militarism, and a dash of religiosity by deploying it as soundbyte fodder in one’s petty sub-aesthetic skirmishes (to avoid any such future boneheadedness by getting clear on what “neoconservatism” actually is, I recommend David Harvey’s 2005 A Brief of History of Neoliberalism, pages 81-85, though the whole book provides an essential synopsis of our political era)—but poetic illiteracy as well, at the levels of both craft and reception. Because let’s face it, poets who ‘innovate’ away from the use of metre, rhyme, and the spectrum of rhetorical devices at least sometimes do so because they know they don’t have the chops, and so need to find less- (or even un-) populated avenues along which to busk their talents. In our time of relentless self-branding, in which even poets seem to have internalized the logic of a market that would clearly rather they were more useful, more profitable, more easily understood, and generally shallower, such a move to stake out one’s own superficially unique plot of literary turf both satisfies that market’s demand for novelty and helps further the myth of individualism upon which its continued dominance depends. To look at it from a readerly (or at least fellow-writerly) perspective, there’s no good reason to like, say, Lisa Robertson but not Eric Ormsby (or vice versa) unless you are: a) so invested down to your very identity in liking (or belonging to) one camp of writers that you won’t risk diluting your carefully cultivated personal brand by truly engaging with writers of another camp (in other words, you need to stay ‘on message’ or risk forfeiting your carefully burrowed-into literary wormhole); or b) so blindly committed to one narrow set of aesthetic strategies as being the ‘right’ one that you have fallen into artistic and readerly complacency (in other words, you’ve become so ensconced in certainty as to have forgotten that aesthetic experience often precisely entails uncertainty, the scrambling of one’s categories). Paradoxically, then, those who mistake themselves for radicals often find themselves even more committed to the postmodern marketplace’s central ideals of individuality, novelty, and niche-seeking than those they dismiss as conservatives. As will be obvious from the moronic google search with which I began this review, these investees of innovation will be all too ready to clump James Pollock’s You Are Here: Essays on the Art of Poetry in Canada (Porcupine’s Quill, 2012) in with the conservative faction and, probably, ignore it. This will be their loss. For Pollock’s book—though it certainly espouses its aesthetic ideals with a firmness that will rankle with both those whose poetics stand at odds with them and, more moderately, those less willing to make hard-and-fast evaluative judgments—provides both a series of unusually nuanced and intelligent takes on individual poets and volumes and, taken as a whole, an erudite accounting of Canadian poetic identity in the late twentieth- and early twenty-first centuries. The book is divided into three sections. The first consists of six reviews—of Daryl Hine, Dennis Lee, Anne Carson, Jeffery Donaldson, Karen Solie, and Eric Ormsby—most of which address more than a single book by each poet, and all of which find Pollock striking a fine balance between evaluation and intense, excavatory engagement. The second section collects reviews of four anthologies (Carmine Starnino’s The New Canon, Sina Queyras’s Open Field, The Best Canadian Poetry in English 2008, and Todd Swift and Evan Jones’s Modern Canadian Poets) and one critical survey (W.J. Keith’s two-volume Canadian Literature in English) which together serve to expand Pollock’s evaluative framework from the level of the single poet’s career to that of the modern Canadian canon and the criteria upon which its in- and exclusions should be made. And finally, the third section pairs off the more theoretical pieces “On Criticism: A Self-Interview” and “The Art of Poetry,” each of which deals with one side of Pollock’s investment in the craft (his first collection Sailing to Babylon was nominated for the 2012 Governor General’s Award). Over the course of the book, several distinct lines of argument emerge: 1) nationalist ideology has proven a negative influence on Canadian poetry, rendering us dully insensible to global poetic influence; 2) a lot of bad or mediocre work has been exalted in Canada either for reasons other than its literary merit or out of a mistaken sense of what literary merit entails; and 3) literary merit entails employing the formal and rhetorical resources of the poetic tradition with virtuosity and engaging thoroughly and meaningfully with the best poetry of the past, both in English and globally. Whether readers find themselves nodding or fuming at such a list, they will find much to engage with in Pollock’s meaty elaboration of these claims. On the rare occasions when my American literary friends ask me, as an expatriate Canadian, to recommend some poets from my country, the first thing I do is steer them away from the anthologies. Let me make you a list, I say, and whip out my pen. If I see an old disused copy of The New Oxford Book of Canadian Verse in English or 15 Canadian Poets X 3 on someone’s bookshelf, however, I know it’s already too late; that reader won’t be taking another stab at Canadian poetry until something drastic happens. This passage embodies the characteristic tone of You Are Here—a tone that one might characterize as anywhere from congenial to smarmy, depending what one thinks of its revisionist impulse. I am steered toward the former, not just because I agree with most of Pollock’s guiding premises, but because of a quality this passage does not capture: his extraordinary rigour, the meticulousness with which, in his finest critical moments, he substantiates his strong claims with argumentation so textured and intelligent that one feels dared to disagree. In the book’s opening review, for instance—of Hine’s Recollected Poems: 1951-2004 (2007)—Pollock begins by carefully enumerating what he believes to be the five reasons for the poet’s undeserved neglect in Canada: 1) “our poetry’s puritanical devotion to sincerity and authenticity”; 2) “Hine practices a brand of classicism which, for all its mastery, could not be less fashionable”; 3) “his highbrow homosexuality”; 4) “his highly sophisticated prosodic imagination”; and 5) “the matter of Hine’s long-term residence in the United States during an era of fervent nationalist anti-Americanism in Canada.” Each of these points receives deft elaboration, and overall this structural framework serves to lend contextual stakes to the skillful close readings of Hine’s poetry that make up the bulk of the review. Indeed, Pollock’s structural and close-reading prowess comprise his two chief critical strengths. In his review of Carson’s Decreation: Poetry, Essays, Opera (2006), for example, Pollock’s own structural premise—that “Carson has always been a writer in the tradition of the sublime, a tradition stretching back through modernism and Romanticism to Homer, Sappho and the Bible”—equips him with a theoretical concept (i.e., the sublime) both broad enough to do justice to the poet’s capacious erudition and specific enough to produce close readings that prove revelatory in their illumination of the deeper spiritual and aesthetic structure of Carson’s complex book, with its tricky interplay of subtitular genres. In this essay, Pollock shows himself to be precisely the sort of critic Carson needs more of: neither adulatory nor sneering, equally respectful of both her skill and her potential failings, and willing and able to meet and inhabit her eccentric intelligence rather than simply dismissing her as obscurantist. Pollock’s review of Jeffery Donaldson (an overdue assessment of a wonderful poet), entitled “The Magic of Jeffery Donaldson,” embodies a similarly felicitous combination of close readings performed within an insightful structural framework. Pollock broadly divides Donaldson’s poetic output into the “black magic” of his dramatic monologues—in the critic’s view too often infected with the “stylistic mannerisms” of Richard Howard and lacking in the tensile dramatic irony that animates Browning’s best work in the genre—and the “white magic” of his lyrics proper—three of which (“Above the River,” “Bearings,” and “Feddy Doe”) he singles out as among the best Canadian poems ever written. He then traces the evolution of the latter lyric strain in Donaldson from the confessional mode of Once Out of Nature (1991) and Waterglass (1999) to a more philosophical, meditative mode in Pallilalia (2008). It is a remarkable critical performance, both as a model of using sensitive close readings to advance a nuanced argument, but more crucially as an act of critical communion that blurs almost to effacement the line between evaluation and engagement. Pollock criticizes Donaldson mostly in terms of the poet’s own best aspects, serving both to convince readers of the poet’s essential stature and to illuminate for the poet himself tendencies in his work he may not have framed so consciously and, perhaps, to help shape future directions that work may take. There is, by the way, even more to the phrase ‘lost in translation’ in the last line; it is also an allusion, which is another of this scholarly poet’s favourite spells. ‘Lost in Translation’ is the title of a much-anthologized poem by James Merrill, which is dedicated and addressed to none other than Richard Howard, who is, among other things, a celebrated translator from the French. Merrill’s poem is also about childhood, and involves marionettes, mysteries, a translation from French, and a woman saying good-night to a child in another language; indeed, ‘Feddy Doe’ as a whole strikes me as a brilliantly executed response to Merrill’s poem. The allusion in the final line reads, therefore, like a valediction to Richard Howard, and a transfer of poetic allegiance not only from dramatic monologue to lyric but specifically from Howard to Merrill. So much here rings as typical of Pollock’s critical preoccupations, and how one responds to his “agonistic” (to use another Bloomian term that Pollock favours) conception of poetic influence—that is, how readily one swallows claims like that made above, that Donaldson’s self-overcoming required that he shift his allegiance from Howard to Merrill—will to some extent determine how warmly one receives Pollock’s criticism as a whole. Setting aside the awkward way in which the word “allegiance” conjures images of a defecting general committing his forces to one liege-lord over another, rather than a poet with a no-doubt wide range of influences whose sway over him may shift fairly unconsciously from poem to poem, there’s something undeniably smart and convincing about the way Pollock traces the allusive echoes from Donaldson to Merrill to Howard here. Problems arise with this conception of influence, however, when either a) the critic starts to identify allusions as intentional which are far more likely unconscious echoes (as Pollock does with Solie, in casting her “Medicine Hat One-Way” as a “revisionary response” to Hine’s “Plain Fare”); or, more detrimentally, b) the critic ignores or denigrates those poems in which he cannot find evidence of agonistic influence or a recognizable allusion a past work (as he also does with Solie, whose poems seem treated as “good” in proportion to how readily Pollock perceives allusive engagement in them). I number myself among these new aesthetes; as a critic, I too stand for aesthetic pleasure, and like my fellow critics I focus on poetry as an art, particularly its rhetoric and prosody. I avidly search out poems that engage creatively with other poems, including the great poetry of the past. I believe in the primacy of art, which must remain at the heart of any good theory of poetry. I insist that, unless a poem succeeds as a work of art per se, it is not a successful poem, no matter how much I may sympathize with its other values. The realm of literature needs to be won back from the sociological, the ideological, and the politically approved, and restored to the human spirit of delight, originality, imagination, and, above all, the love of what can be achieved through verbal sensitivity and dexterity. There is no inherent reason why Canadian writing, prose or verse, should not take a major part in this endeavor. Ironically, Keith’s cry against ideology is precisely the commonest manifestation of ideology in our aesthetics-obsessed age: the kind that pretends that there exists a place beyond ideology, a haven of aesthetic pleasure free from the corrupting influences of politics and sociology. Keith (and by extension Pollock, if he swallows this nonsense) is like the teenager who retreats to the headphoned sanctum of his room to escape his fighting parents below, reveling in petulant autonomy while oblivious to the fact that his very idea of room-as-sanctum is conditioned by what he’s trying to escape. In other words, what qualifies for us as “delight, originality, and imagination,” or which aspects of “verbal sensitivity and dexterity” we are most attuned to as any given person in any given time is significantly shaped by the political, social, and otherwise material conditions that produce both us and the art we encounter. This is why the best argument in favour of formalist practice remains a social one: that such practice does justice to poetry’s social origins and orientation, linking us rhythmically and rhetorically to a shared past and giving shape to our aspirations for communal futures. This is also why the most compelling argument advanced by the ‘innovative’ school against such formalisms is also precisely social: that the old forms stand at odds with our modern social formations, that we must seek out new forms to reflect our societal disorientation. These two positions might best be thought of as the two ends of a continuum, somewhere along which—whether they know it or not—most poets today situate their practice. That Pollock takes no account of how our criteria of value are socially conditioned is a serious critical flaw. That (in his essay on “The Art of Poetry”) he repeatedly labels himself an “aesthete” and exalts “aesthetic pleasure” without working to articulate what precisely such pleasure entails (Is it Kant’s “purposiveness without purpose”? Adorno’s “recollection of the possible in opposition to the actual that suppresses it”? One of myriad other conceptions? Something new?) or considering how “pleasure” is itself a socially conditioned phenomenon right down to the level of the individual—where Pollock might get “pleasure” from a paragraph of well-turned blank verse, an opposite-minded critic might derive an equivalent “pleasure” from what Pollock would see as disjointed prose poetry—exposes a blindness in his work. Something similar might be said of his conception of “verbal mastery”; while it’s clear what he thinks such mastery entails, it’s not at all clear that he knows that why he thinks as he does isn’t entirely up to him. I’m not espousing a relativistic position here; as I’ve said, I agree with many if not most of Pollock’s premises and assessments. What I don’t agree with, however, is the hollow theoretical foundation upon which his justification of such assessments ultimately rests, namely the chimeric notion of an autonomous aesthetic sphere (and by extension sphere of poetry). Such a notion is an ideological mystification that only serves to install our biases as facts and, while appearing to invest art with great seriousness by granting it its own sacrosanct sphere of contemplation, actually trivializes art by ensconcing it safely away from our material concerns. 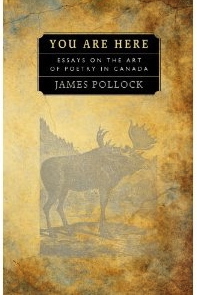 While Pollock is certainly right, then, that ideology (particularly of the nationalist variety) has had a deleterious influence on Canadian poetry by causing bad or mediocre work to be exalted despite its technical incompetence, the solution is not to turn around and pretend that poetry and ideology ought to be kept apart (as Pollock implies repeatedly throughout You Are Here). The solution is rather to attune ourselves more thoroughly to our saturation in ideology, its inescapability, and the artistic opportunities our entrapment affords us. (In the mid-1930s—like ours, fiercely ideological times—Auden characterized the role of artist and scientist alike thusly: “To understand the mechanism of the trap.”) The best poets writing in English are doing this. Take Frederick Seidel, a poet who embodies all the prosodic and rhetorical mastery, all the thoroughness of engagement with past poetry that Pollock demands—and yet few poets writing are more thoroughly subversive of ideological mystification. Whether one believes that Seidel’s persona is a gleeful conscience-less member of the 1%, a vicious hedonist who has flipped the latch on the socioeconomic cage and loves to rub the rest of our noses in it as he flits about on demonic wings, or that he is in fact a satirist out to undermine oligarchy through the sheer pigshittedness of his glorying in it, the point is that his poetry’s brilliance largely derives from its immersion in and engagement with the slick recalcitrant materiality of our tastes and desires, both bodily and (and this really means the same thing) aesthetic. the breaking changes of a life to come. In a recent interview with Open Book, Pollock says of the post-release experience of Sailing for Babylon that “It’s been fun reading the critical reactions to the book so far, and seeing people catch the allusions”—he really is somewhat fixated on allusion—and goes on to mention this poem, saying that it was written with three particular poems in mind, one of which is Rimbaud’s “Poets at Seven Years.” Another is almost certainly Keats’s “On First Looking into Chapman’s Homer,” the speaker of which experiences a similar kind of revelatory opening to that envisioned at the ending of Pollock’s poem, with the key difference that while Keats’s speaker really does find an expanded universe within the pages of George Chapman’s translation of Homer (“Then felt I like some watcher of the skies / When a new planet swims into his ken”), the “breaking changes” of Pollock’s poem occur only in the hypothetical tense set out in the poem’s opening “If only”—a fact that lends the poem the poignancy of a revelation narrowly missed rather than one gloriously collided with. There is much to admire here: the sprezzatura with which Pollock conducts the blank-verse line, varying stresses and caesurae enough to keep monotony well at bay but not so much as to ever feel like he’s straining to meet the form; the subtle modulation of the sonic motif, from “strangest words” to “siren’s” to “sing” to “peal” to “slender bell” to “breaking changes”; and finally the way the third-person point of view (“he”) works with the hypothetical mood to lend the sense that this child exists as a version of the speaker never fully actualized, imprisoned in the thwarted potential of that “If only.” And yet—and yet. Despite the essential virtuosity at work here and throughout Sailing to Babylon, and despite my essential admiration for its achievement, I’m occasionally fraught with the nagging sense that not enough is at stake here aesthetically—by which I mean I don’t feel myself pushed upon, à la Adorno, say, by the pressure of the possible upon the actual or, to put it more colloquially, “The Poet at Seven” doesn’t impress upon me any new sense of poetry’s communicative possibilities because I feel like the essential elements of what and how it’s communicating have been closely combined too often before. A 13-line poem in blank verse about a child newly awakened to the life before him by a great book and a teacher for whom he feels a curious mixture of filial loyalty and nascent desire: this is a premise that should not work, and yet it does—or does it? This uncertainty points to the potential drawback of a poetics too steeped in allusion. an ecological champion as grass. Pollock begins this passage with a sly reference to the Dantean provenance of his poem (“What a hell this garden is”) then deploys terza rima’s capacity—shared with all forms demanding such virtuosity—to void commonplaces of banality, infusing truisms with profundity (“without killing there would be / no evolution, nothing human”). Next, he borrows one of the climactic claims of Wallace Stevens’s “Sunday Morning” (“Death is the mother of beauty”) and forges out of it a deft cyclical antimetabole appropriate to his own poem’s nuanced sense of ecology (“Nature / makes beauty into death abundantly / and death into beauty”). Finally, he provides us with a mini-lesson in ant evolution, skillfully couched in an ‘if-then’ statement so as to temper its didacticism. Pollock’s willingness to double his adjectives (“strange modest class,” “tropical wingless wasps”) briefly lifts the passage into an exoticism appropriate to the “cloudy jungles” of “thirty million years ago” before the determinedly Latinate “ecological champion” sets us back down on the firm “grass” of today’s scientific perspective. On the whole, form and content work here in a complementarity akin to the symbiotic vision of ecology at the passage’s core—and crucially, its deep allusiveness never eclipses its singularity of vision, but instead the passage displays its contemporaneity precisely through the way it revisions its sources through a present-rooted ecological lens. Passages like this afflict me with critical questions. Shouldn’t I just accept this as both beautifully written and true, admire, and move on? But isn’t there a sense in which the three and two-thirds lines from “it all fills” to “death” consist entirely of cliché both verbal and emotional, ventriloquize far too many predecessors at once (many of them justly anonymous), and really arrive so worn with pseudo-insight that even masterfully composed terza rima can only lift them into the barest semblance of profundity? And really, couldn’t all this be said of the entire passage? But given that it ends on its own built-in defence against these accusations (“the giant past for making us / ourselves”), shouldn’t I—again—just give Pollock’s usual virtuosity the benefit of the doubt? But doesn’t the present make us ourselves too? Is this an example of the urge to timelessness trumping actual engagement? Of formal mastery becoming servitude to tradition? What about the inverse: rejection of tradition becoming slavery to fashion, which is really novelty, which is easy to mistake for innovation? Isn’t that what Pollock, in both his poetry and his criticism, ultimately strikes against, and isn’t that a much greater danger nowadays? Isn’t that much worse? Well, is it?